The handover of the report summary signalled the end of an emotive process that saw survivors of the country's most bloody electoral episode in a decade give harrowing tales of how they lost their loved ones through shootings linked to the army. Speaking on the side-lines of his organisation's 2019 national budget review in Harare, Bomba said the time allocated to the probe team was not enough to exhaust the matter through hearing submissions from every witness. "We actually believe the period for the hearings was too short; there are a lot of people who are still holding stories, people who are bottling up pain, people who felt that they want to be heard. So there has to be a process that allows for the airing of that pain. "Otherwise you are creating another moment that is going to compound the collapse of our social fabric and divisions, polarisation, hurt and trauma," he said. Bomba, who heads the non-partisan grouping of youths, women, students, the church, among others, said the commission had become a necessary platform for Zimbabwe's hurting citizens to come and let out their feelings. "The commission has an opportunity to contribute towards repairing that harm and bringing about greater social cohesion if they handle this thing well. "But even if the commission wraps up within their three month mandate, there has to be other processes that enable everyone who is feeling this pain and this hurt with regards to what happened on August 1 so that we can say never again." 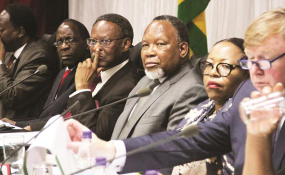 Zimbabweans are anxious to know how the Commission tackled the matter in a situation in which the country's army is accused of gunning down six civilians while trying to quell the Harare disturbances. "We have to start by reminding the President that he is on record saying that the report of the inquiry will be published. "So we are all taken aback by statements made by the president's spokesperson George Charamba a couple of days ago that the publication of the report is at the discretion of the President. "This country has a very bad record in terms of publishing reports of various commissions of inquiry. We demand that let things be different this time. "The hearings were held in public let that report be made public."